Help your students build their reading and writing skills with these new tools! We have just released two new resources in our Language Arts section to help you teach your kids some basic concepts using your interactive whiteboard. Our Adjectives and Adverbs tool is aimed at teaching 1st and 2nd graders how to recognize when an adjective is needed in a sentence versus an adverb. Our new Pronouns tool tests 6th graders’ knowledge of pronoun-antecedent agreement. This new activity lets kids practice their ability to differentiate between when an adjective or adverb is needed in a sentence. In Adjectives and Adverbs, students are presented with a sentence with one word missing, they then have to choose from two options below to fill the blank correctly, one word is an adjective and one is an adverb. Try also Gynzy’s Adjectives tool. This tool helps students have an understanding of adjectives by putting the words in the correct order. The Pronouns tool tests students’ ability to use the correct pronouns relative to the gender and number of subjects being referred to. 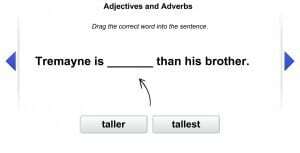 They are presented with a sentence with the antecedent in question italicized; the pronoun in the sentence is removed. Students then choose between two options of pronouns, one wrong, one correct; they can then check their answer. In order to teach about reflexive pronouns use the Reflexive Pronouns tool. Students learn how to use reflexive pronouns. Another great activity is the Relative Pronouns tool. With this activity students learn when to use relative pronouns (who, whose, whom, which, that) and relative adverbs (where, when, why). Have fun using those interactive whiteboard activities!